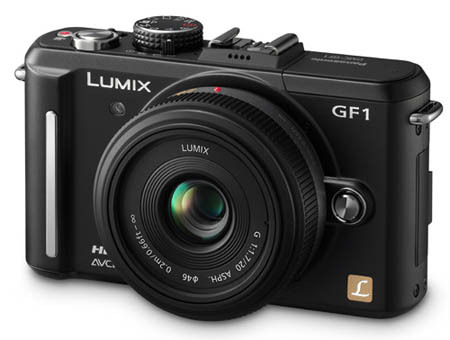 The Panasonic Lumix GF1 features the performance, image quality and interchangeable lenses like a dSLR, but in a much smaller and easier to carry body. Click Here to read the entire conclusion. Panasonic's newest dSLR-like interchangeable lens system camera, the Lumix GF1, has the ability to capture professional quality images, HD video and feature Full-Time Live View, all in a body that is much smaller than a standard dSLR camera. This has been accomplished by eliminating the mirrors from inside the camera. The new 20mm Ultra-Pancake lens keeps the size down while allowing for bright images in low-light situations. Thanks to the use of the Micro FourThirds system, there are plenty of available lenses, including all of the FourThirds and Leica lenses with the use of an adapter. One of the biggest selling points of the previous model, the GH1, was its ability to capture 1080p HD movies at 24fps. The GF1 does not allow for the capture of 1080p but is limited to 720p HD video capture at 30fps and up to 17Mbps. This will help to produce smoother higher quality videos, but at a smaller resolution. The new pancake lens uses a drive system for the autofocus, that you will hear when play back your movies. A dedicated video capture button has been added to the top of the camera that allows you to start recording with just the touch of a button, no need to be in Video capture mode. This is a feature that Panasonic has been adding to its point-n-shoot cameras as well. The Panasonic Lumix DMC-GF1 is available with the 20mm, f1.7 pancake lens or with a 14-45mm, f3.5-5.6 micro four thirds lens for $899.95.